Reports are listed alphabetically under the Reports section of the HSTOnline menu. The Reports that appear will depend on the fields and features you have enabled/disabled in Program Options. Student users can be given access to Reports via the permissions for their User Account. 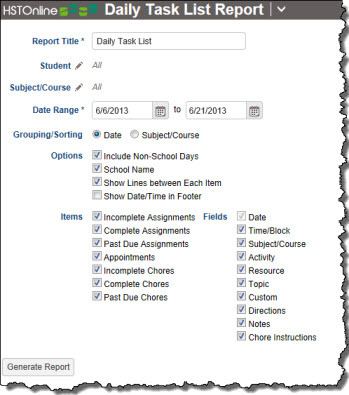 Home/Away Shows school hours spent at home vs. those spent away from home; can show general 'home' vs. 'away' or specific locations Assignment Location and Time Spent or Sessions fields must be enabled. 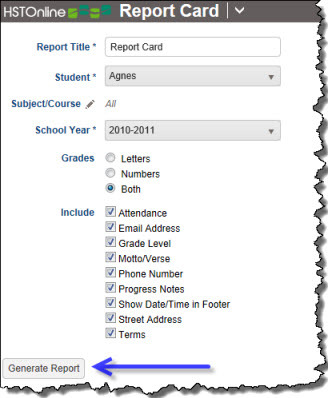 Report Card You can select which Subjects/Courses are included in a Report Card for your Student. Grading must be enabled, and that you have at least one completed, graded Assignment within the dates of the report. When you click or touch on a Report name, the options window for that Report will be displayed. See the Help Page for each individual report for an explanation of the available options. Set the options as needed. HSTOnline will remember your option settings from one session to the next until you change them. Options settings for each report are stored separately. On the HSTOnline menu, click or touch the name of the Report you want to create under the 'Reports' section. The Reports available to you will depend on your Program Options selections. 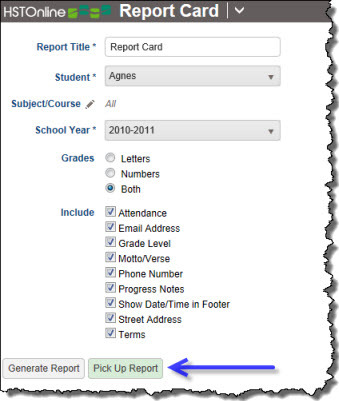 Student users can run reports if they have been given permissions to do so. Fill out the Report options as needed. HSTOnline will remember your settings for that report until you change them. Click or touch the Generate Report button. HSTOnline will create the report using the options you have set. This process can take anywhere from 5 seconds to 2 minutes, depending on the complexity of the report. Report Cards and Transcripts will fall towards the longer end of that range.